Recorded Downtown Sound, New York, Sep 5, 1978 (A side), and Sep 6, 1978 (B side). 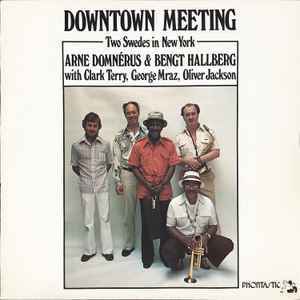 Swedish altoist/clarinetist Arne Domnerus and pianist Bengt Hallberg travelled to New York to record this Phontastic set with flugelhornist Clark Terry (who is on half of the songs), bassist George Mraz and drummer Oliver Jackson. The group performs three Swedish songs (including Hallberg's "Mulen") and a variety of swing standards that are highlighted by "Gone with the Wind," C.T. 's feature on "Come Sunday," "In a Mellotone" and "C Jam Blues." Extremely clean. Vinyl looks unplayed.